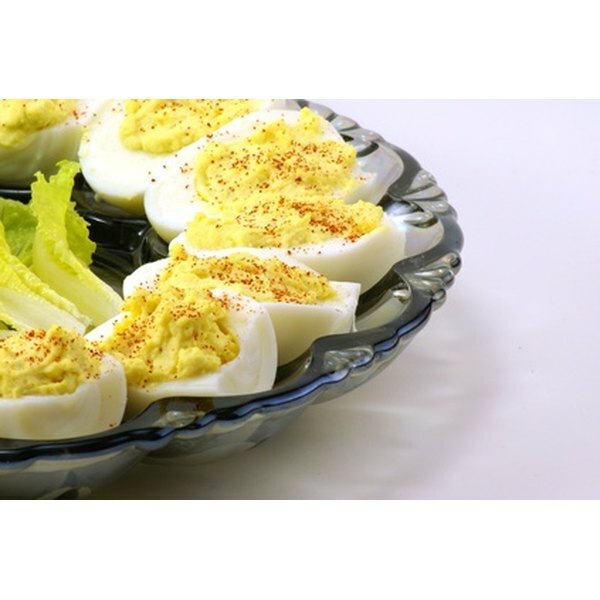 Deviled eggs are a cold finger food that is often served at parties. Planning finger foods for a spring party is not difficult when you consider the season and the comfort of your guests. Whether you host your party inside or out, spring-inspired finger foods will help make the gathering a success. Keep in mind that party foods should not be messy or complicated to eat, such as barbecue wings or corn on the cob. Guests should be able to carry their plate and beverage and mingle without difficulty. Serve spiral-sliced ham and different cheeses on a dinner roll. Ham is usually on sale during the spring months near Easter, so is a budget-friendly meat. Provide mayonnaise and gourmet mustard on the serving table. Prepare deviled eggs. They are a cool, refreshing and nutritious finger food. Party food that is uncomplicated to eat and simple to transport allows your guests to mingle during the party. Cut up fresh vegetables, such as radishes, celery and jicama to dip into a savory dip, such as ranch or a dill dressing. Add grapes, nuts or pineapple to your favorite chicken salad recipe. Serve it on miniature croissants for a cool and elegant party sandwich. Roast fresh asparagus spears on the grill and baste them with olive oil or butter and add a sprinkle of garlic powder. Another idea is to spread deli-sliced ham with spreadable cream cheese. Place a canned asparagus spear on the ham slice, roll it up and seal with a party toothpick. Serve petit fours and sugar cookies with white icing. Use pastel-colored frosting to create spring flowers on top of the desserts to add a springtime touch. Serve beverages like mimosas -- 2 cups orange juice mixed with 1 bottle dry sparkling wine -- or lemonade with a mint sprig to enhance the springtime theme.